There are some things you might not know about Greek immigration to the United States. 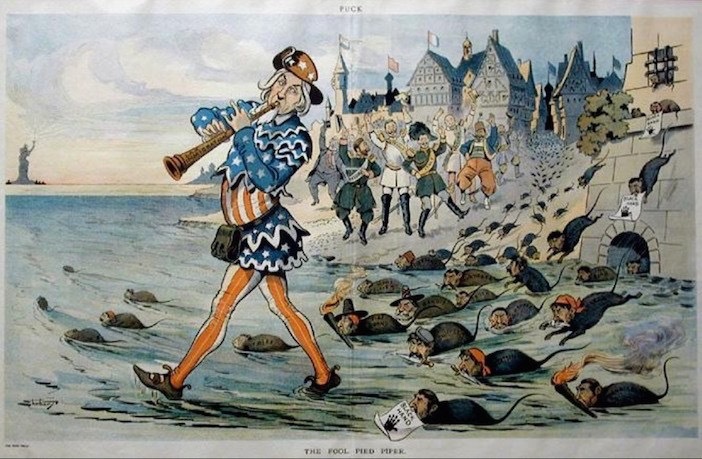 This history becomes particularly relevant when watching today’s news and political candidates like Donald Trump, supported by huge and vociferous crowds, call for the complete ban of people from entering the United States based on their race or religion. This is nothing new. In fact– today’s “undesirable” Muslims (in Donald Trump’s eyes), were yesteryear’s Greeks. It’s a forgotten history— something that only occasionally comes up by organizations like AHEPA or the occasional historian or sociologist. In fact, many Greek Americans are guilty of not only perpetuating— but also creating— myths of our ancestors coming to this country and being welcomed with open arms. A look back at history will prove that this usually wasn’t the case for the early Greek immigrants to the United States. Greeks, their race and religion, were seen as “strange” and “dangerous” to America and after decades of open discrimination, Greeks were finally barred— by law— from entering the United States in large numbers. 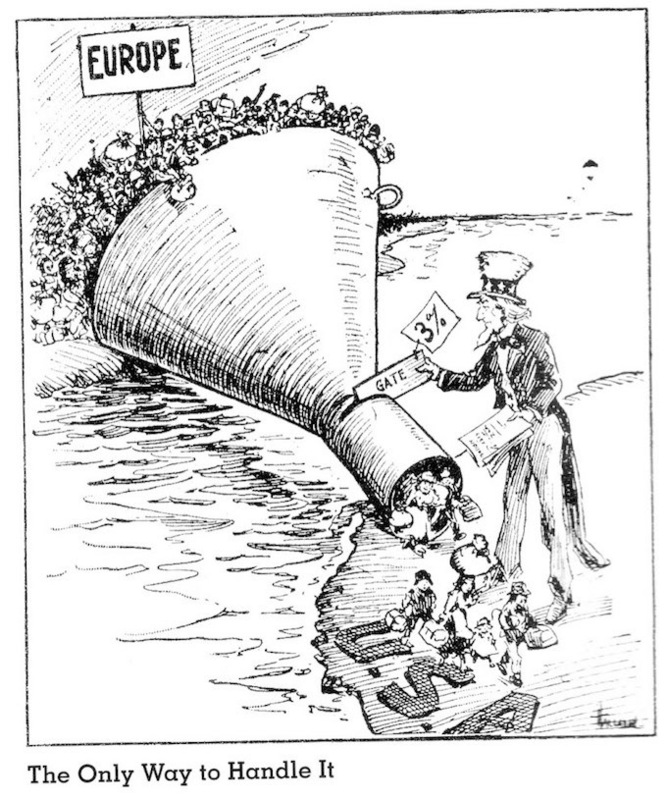 The Immigration Act of 1924 imposed harsh restrictions on Greeks and other non-western European immigrant groups. Under that law, only one hundred Greeks per year were allowed entry into the United States as new immigrants. Much like today, when politicians and activists like Donald Trump use language against a particular ethnic group— like his call to ban all Muslims from entering the United States, the same was the case a hundred years ago. Except then, Greeks were one of the main targets. 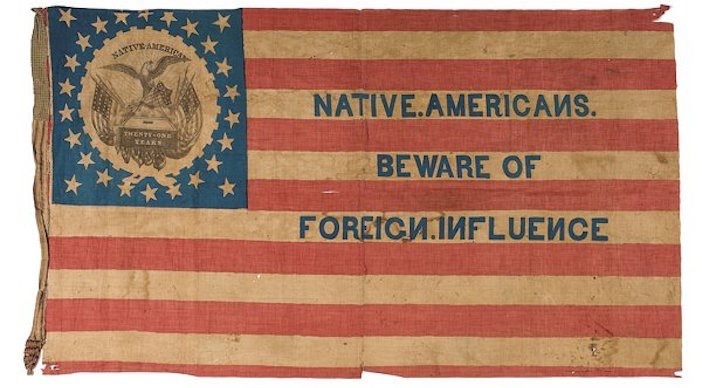 There was a strong, loud and active “nativist” movement that was led by people who believed they were the “true Americans” and the immigrants arriving— mainly Greeks, Italians, Chinese and others who were deemed “different” and even “dangerous” to American ideals, were unfit to come to America. 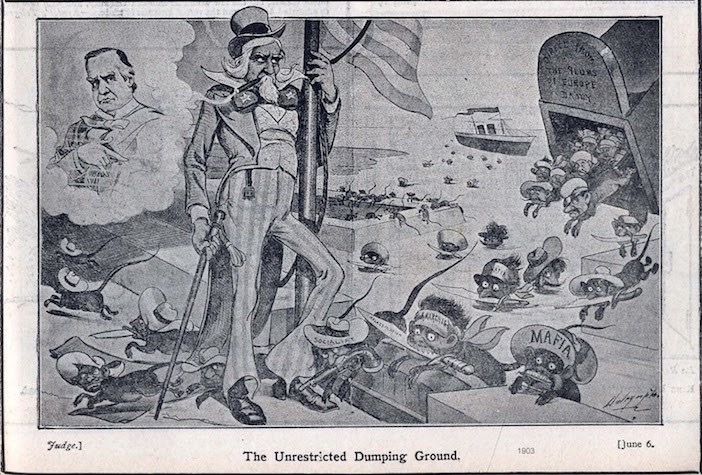 America, the “unrestricted dumping ground” which depicted Greeks and other Eastern Europeans as animals. 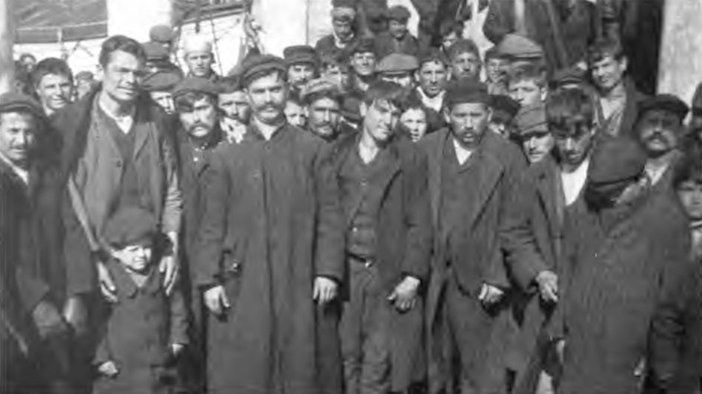 At the beginning of the 1900s tens of thousands of Greek immigrant men began arriving in the United States, fleeing famine and war back home. The 1897 Balkan Wars were especially brutal and tens of thousands of Greek men headed for safer and more prosperous shores. Between 1900 and 1920, according to official U.S. government records, more than 350,000 Greeks immigrated to the United States— 95 percent of the immigrants were men. In his epic research and meticulous writing, the late Charles Moskos noted in his book “Greek Americans: Struggles and Success” that from 1900 to 1915 close to one out of four men in Greece departed for America. That’s almost 25 per cent of the entire male population of the country. Greeks scattered throughout the United States. Many settled in mill towns like Lowell, Massachusetts while others went west, taking hard jobs in coal, copper and salt mines. Tens of thousands also settled in Chicago and other Midwest urban centers. In places such as Idaho, Greeks could not live in certain neighborhoods and were restricted from using public parks. In 1909, the Rhode Island legislature debated a bill that would have banned non-citizens from fishing for lobsters. It was aimed at Greeks by “native” locals who felt Greeks were crowding native Americans out of a profitable trade and gaining too much control over the industry in the region. 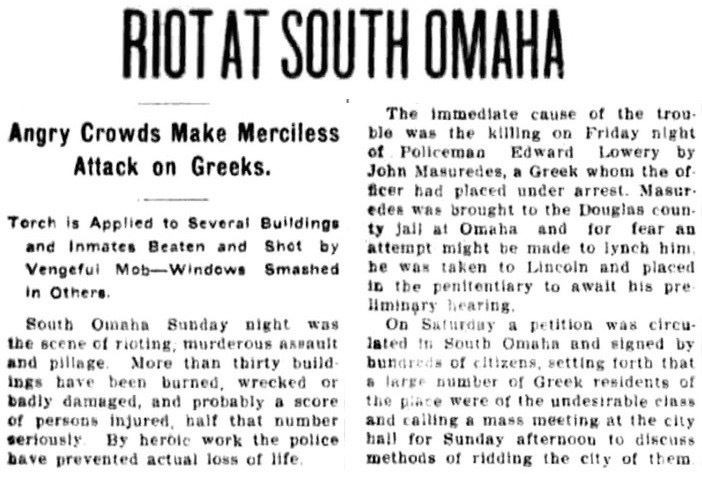 A violent uprising took place against Greek lumberman in Grays Harbor, Washington in 1912 where hundreds of Greeks were forcibly expelled from the town by boat and train. 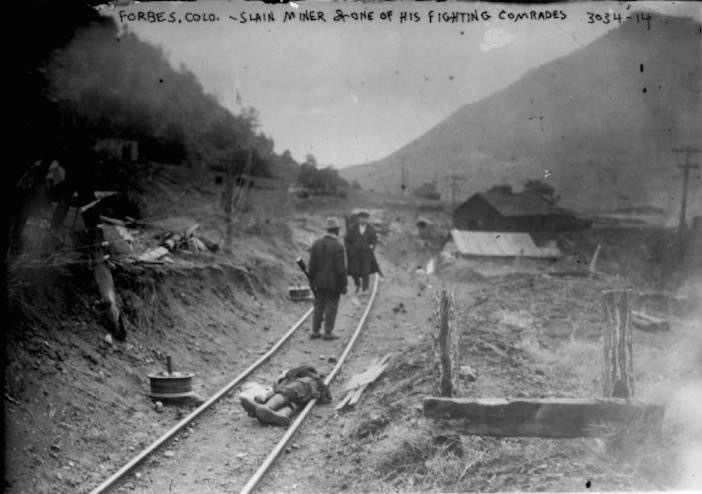 Violent uprisings— often led by the U.S. military and national guard also took place in mining towns like Bingham, Utah and of course, Ludlow, Colorado, where newly naturalized community activist Louis Tikas was gunned down by a member of the U.S. National Guard during what has been called the “Ludlow Massacre”. These incidents were fueled by anti-immigrant, anti-foreigner elements that were prevalent in America at the time. 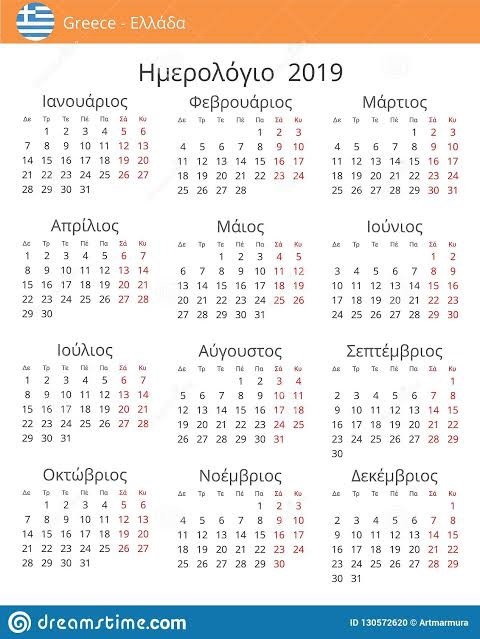 But as the story goes— despite this open discrimination, racial antagonism and even an entire government mechanism working against this community, the Greeks in this country prospered, organized and became an active and vibrant part of its fabric. A look at calls for closed borders today by politicians and activists— and complete bans on certain groups entering the nation based on race, nationality or religion, are nothing new. In fact, they’re a big part of American history. Fortunately, though, we have the mistakes of the past to draw on so that we don’t repeat these same mistakes in the future. architecture, which emulated the Greeks while the north emulated Rome and Harvard degrees are still in latin. their neighbors in Smyrna and Greece had participated in League support for the Whites. As most Orthodox churches readily took the Czar’s money Lenin proceeded to sell them. chartering that all Orthodox churches belonged to Moscow.